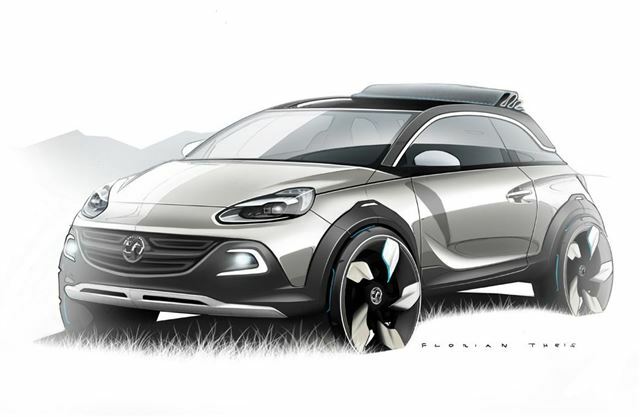 Vauxhall is to show off the ‘Adam Rocks’ concept, sketched here, at the 2013 Geneva Motor Show. The miniature ‘urban crossover’ is designed with the same level and depth of customisation as the Adam hatchback at its core. It’s styled with a bolder, wider stance and features a folding fabric roof. The Adam Rocks rides 15mm higher and is 20mm wider than the standard Adam, and has much larger wheels. There has been no word on whether it will make production, but there’s every chance some of the details will eventually make their way into the Adam range, particularly the fabric roof, a la Fiat 500C and Citroen DS3 Cabrio.